The CARHA Hockey World Cup is coming to Richmond next April. The countdown has officially begun. 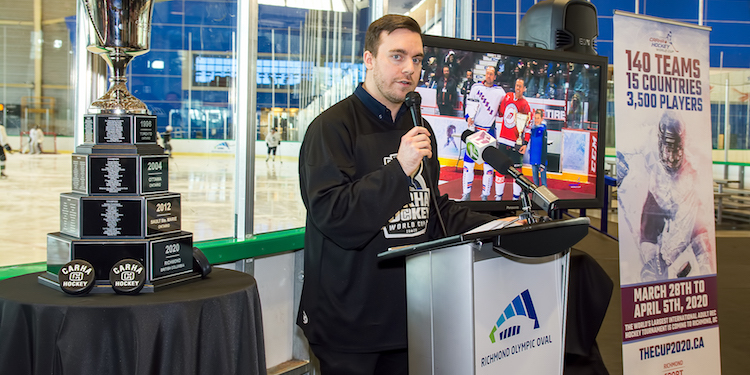 In less than a year—March 29, 2020 to be exact—Richmond will again be in the international spotlight as hosts of the 2020 CARHA Hockey World Cup. Since hosting the long track speed skating events during the 2010 Olympic Winter Games at the Richmond Olympic Oval, the city has gained a well-earned reputation for hosting outstanding sporting events. Excitement is already building in the local community for the CARHA World Cup March 29 to April 5 next year. CARHA tournament manager Lucy Peeling said they’re thrilled to bring the event to such a passionate, vibrant and multi-cultural city, showcasing the very best Canada has to offer to hockey players from around the world. The Richmond event is expected to feature some 140 teams from 15 countries and generate up to $15 million into the local economy. Since 1996, the number of European teams participating has increased to where 60 per cent of tournament registrants are from outside North America. Held every four years, the tournament is based on the Olympic model. Adult recreation players from age 19 to 70 are eligible to participate. The majority of games will be held at the Oval and Richmond Ice Centre, with Minoru Arenas also hosting several major games. There will be no admission fee to games, which organizers hope the community as a whole will strongly embrace. Local minor hockey associations (Ravens, Jets and Sockeyes) have already stepped forward to show their support. The international tournament concept is close to Paterson’s heart. Pam Lacroix, manager of Richmond Sport Hosting, says CARHA’s site visit to Richmond last year convinced the organization this was the place to host the 2020 World Cup.